Gulff Color Resins are made for attraction. Fish can see colors  then use colors. You are the artist. Think pink  create candies for graylings or make glowing green streamer heads and bodies. 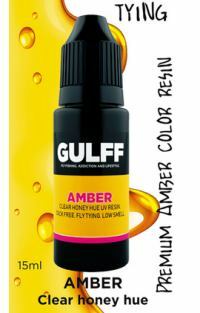 Gulff Amber Resin is a light honey coloured resin. You can create beautifull natural looking flies. We suggest you to try Amber with brown and golden fibers for nymphs and larvae. It is at best for small insect flies. Resin covers 5%. Make thin layers and cure 3seconds. Wait for 5seconds beforel you touch the fly. Pink Attack is designed for versatile use. It is perfect for small ants, larvaes, perdigons, pike fly bodies and streamer heads. Color resin series are made for attraction  it cannot be ignored! Fish can see colors  then use colors. You are the artist. Think pink  create candies for graylings or attraction for predators. Resin covers 50-60%. It lets you to use other materials under the resin. Use thin layer clear resin for covering. This is how to create layered desing. Mix the resin if pink hue is not stable and deep enough. Take off the bottle tip and use a small stick for mixing. Make thin layers and cure 5 seconds. 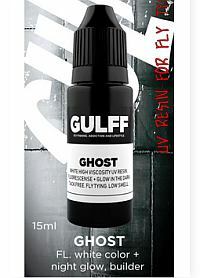 Ghost White Glowing Resin is developed for ice fishing hooks and fly streamers in many connections. This resin attracts fish very well because of in the night glowing effect. We suggest to combine Ghost resin and Gulff Ambulance resins. 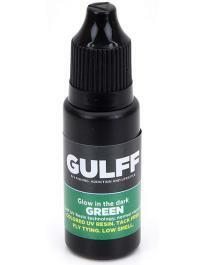 Glow Green Resin is designed for versatile use. It is perfect for small glowing larvae and perdigons, pike fly bodies and streamer heads. Resin covers 50-60%. It let you to use other materials under the resin. Use thin layer clear resin for covering. This is how to create layered desing. A very famous combination is Glow Green resin, Hot Orange Bead and Black Magic spot on the neck.